Participants in the WTF Olympic Coach Seminar pose with WTF leaders for a group photo on the second day of the seminar at the Haeundae Grand Hotel in Busan, Korea, on June 17, 2008. In a strong show of their commitment to fair play at taekwondo competitions, the participants unanimously adopted a resolution on fair play. In a strong show of their commitment to fair play at taekwondo competitions, participants in the WTF Coach Seminar for the Beijing Olympic Games resolved to respect fair play on the second day of the three-day event at the Haeundae Grand Hotel in Busan, Korea, on June 17, 2008. The seminar participants also resolved to "respect and accept the judgment and decisions of the refereeing and technical officials in all taekwondo competitions." All the participants, about 100 from about 50 countries, unanimously adopted an Olympic coach resolution, which read, "I, as a coach of a participating national taekwondo team in the Beijing 2008 Olympic Games, am fully determined to respect fair play for the success of taekwondo competition, and hereby abide by the following resolutions." It read, "I will respect and treat every athlete, coach and official equally in accordance with the Olympic Charter and the Rules and Regulations of the World Taekwondo Federation, regardless of race, gender, ethnicity, and religious beliefs." "I will be a positive role model for my athletes and promote fair play, sportsmanship and courtesy at all times." "I will ensure the safety of all athletes. I will not tolerate shameful or undesirable acts from my athletes. I will accept an sanction imposed on me and my national taekwondo association by the World Taekwondo Federation should I violate any provision within the WTF Rules and Regulations," the resolution concluded. As part of its efforts to ensure the fairest refereeing and judging at taekwondo competitions, especially the upcoming Beijing Olympic Games, the WTF has devoted over the last four years most of its time and energy to improving its refereeing and judging. The ongoing Olympic Coach Seminar, the first of its kind in WTF history, continues until June 18. 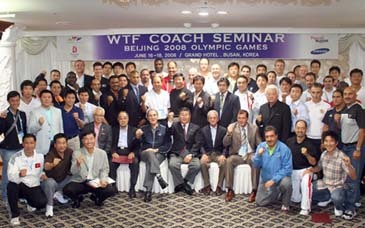 The WTF organizes a WTF Referee Refresher Course for the Beijing Olympic Games on July 13-19.